Beets in a cupcake?!? I know, sounds weird, right? But I promise you they are delicious. 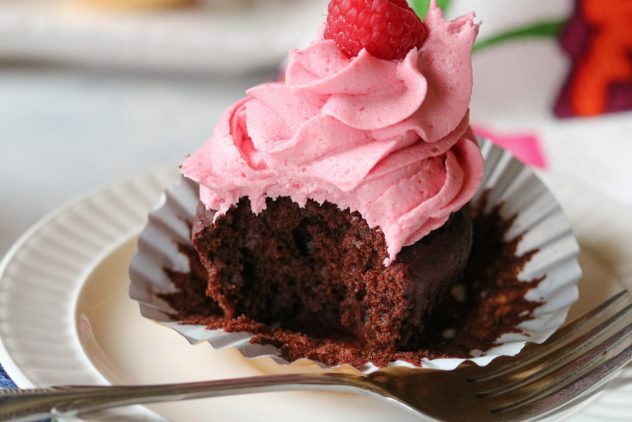 The beetroot adds additional moisture to the cupcakes while also adding some hidden nutrients. “But beets taste like dirt!” I know, I know, I’ve said it myself, but for real, you won’t even know they’re there. I used to despise beets, mostly because my childhood memory of beets were pickled beets and as a kid those smelled HORRIBLE. So I avoided them as much as possible, until a few years ago when I decided to give them a try. I had seen chocolate beet cakes floating around the internet, and I’ll have to admit they caught my attention. Beets? In a cake? So I began experimenting and was pleasantly surprised when I tried my first chocolate beetroot cupcake. Not only do the beets add additional moisture to the cake, but they also add a deep red hue giving the chocolate cake an almost red velvet look. 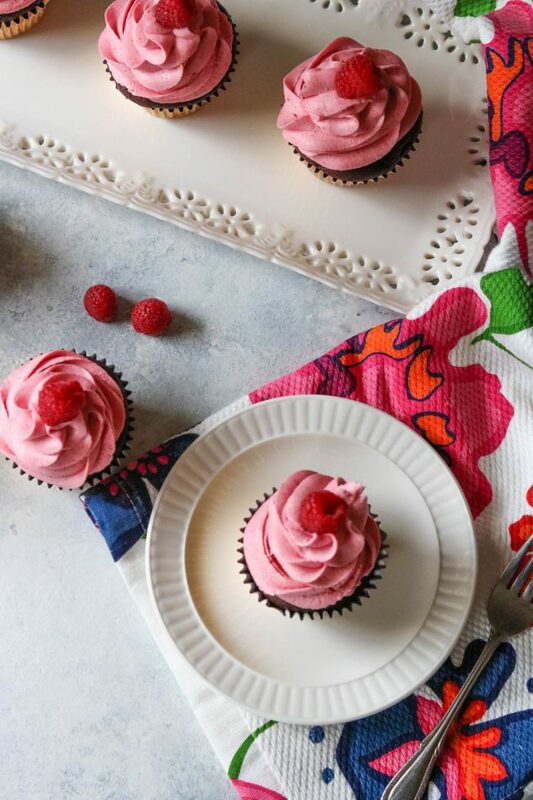 Let’s talk about this homemade raspberry buttercream. There’s just something about chocolate and raspberry. I tend to like that flavor combination more than chocolate and cherry. There’s a local winery that serves the best decadent chocolate cake with a raspberry drizzle and it’s oh so good. 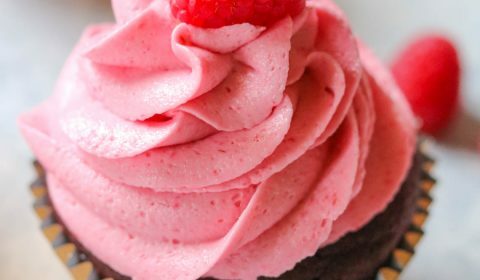 So when I was trying to figure out what flavor of icing to pair with the chocolate beetroot cupcakes raspberry was the first that came to mind. To get the decorated look of these cupcakes, you’ll need a Wilton icing bag and a 2D tip. You’ll have to tell me in the comments below how you liked these beetroot cupcakes. 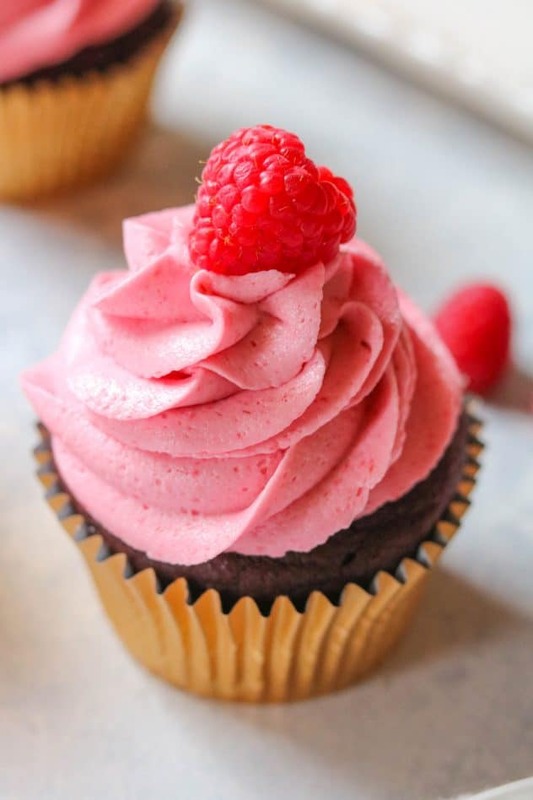 Chocolate beetroot cupcakes with a homemade raspberry buttercream. Hidden nutrients for the kids and full of flavor! In a large pot, boil the beetroots until fork tender. When done, drain and let them cool. Once cooled, peel any remaining skin and cut off the tops and bottoms. Cut the remaining pieces into smaller chunks and add to a food processor. Pulse the beets until you have a smooth puree. In a large bowl, beat the sugar and softened butter together. Add the vanilla and eggs and beat until combined. Add in the beet puree and mix again until combined. Next, add in the flour, cacao powder, baking soda, baking powder, salt, cinnamon, and milk. Add in a portion at a time, allowing the mixture to combine as you progressively add these in. Mix the batter until completely combined. Add cupcake liners to your cupcake pan and fill each with batter until almost full. Bake for 30 minutes or until a knife comes out clean from the center. Remove from oven and let cool. While the cupcakes are cooling, begin preparing your icing. Puree the raspberries. Run the puree through a sieve to remove the seeds. Add the softened butter and powdered sugar to a medium-sized bowl and mix on low until completely combined. Add the raspberry puree and beat on medium speed until well combined and creamy. If the frosting is too thin you can add more powdered sugar. Using a Wilton frosting bag and 2D tip, frost each cooled cupcake as desired. Top with a fresh raspberry and serve.